I must confess. I'm a ThinkPad addict. They're all over my house. At work, my first one was a 560. Then I moved up (so I thought) to a 240. That one had a weird keyboard and I gave it away as soon as I could to someone who was a hunt and peck typist. Next came the 600 series. The last pre-Dell system was an X20 (which I am still using to type this!). I got my daughter a 760 for college and won a second one! Her 760 ran until the hard drive started making funny noises. I replaced it with a new-in-the-box 600. Soon after, my work's off lease ThinkPads started turning up on the recycler's list. I grabbed a couple of 600Es, one to replace her 600 and one for myself. If you max these out with memory and don't load up the hard drive (6 GB) with junk, they make a great Windows XP machine. A few T20s have turned up at the recycler. I grabbed one of them for my Ben in the Den system. When my personal X20 was just about out of warranty, I gave in and got a Dell C400. I sent the X20 off to IBM with a laundry list of "problems." They fixed each one and I got back a practically new X20! I played with Linux at work on this X20 for a while then turned it back to the recycler. I bought it back from them and have been treating it lovingly ever since. It's amazing at the difference in a 4 year old X20 and the latest Dell D400. The X20 still blows it away. I can't imagine what a new X40 would be like. 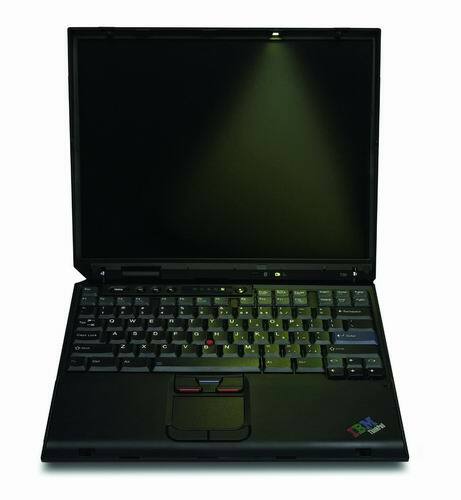 You can see pictures of many of the ThinkPads here.